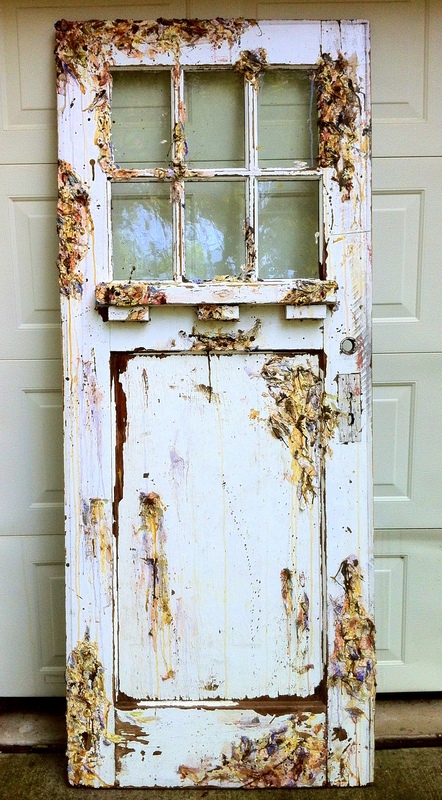 After searching for a set of vintage doors with fully-intact glass windows, I land these two fantastic 1940s doors from a Texas home, that will eventually become “Rosencrantz” and “Guildenstern”. Days are spent removing hardware, cleaning off dirt, scraping paint, wire-brushing, and brainstorming what colors I want to use, and what impact I want to create. Process of rifting begins using 4 different types of spatulas applying my secret plaster concoction (!). Each of 3-6 layers of mix are applied and dried; applied and dried, etc. until I think I’ve achieved the right effect of peaks and valleys for paint. I go back with more brush and scraper work along the way and use bricks as well to rough up specific areas. Now the fabulous, colorful begins beginning with the imagining of color palettes, depth of pigment, specific deposits and spots where I can allow for ambiguity. 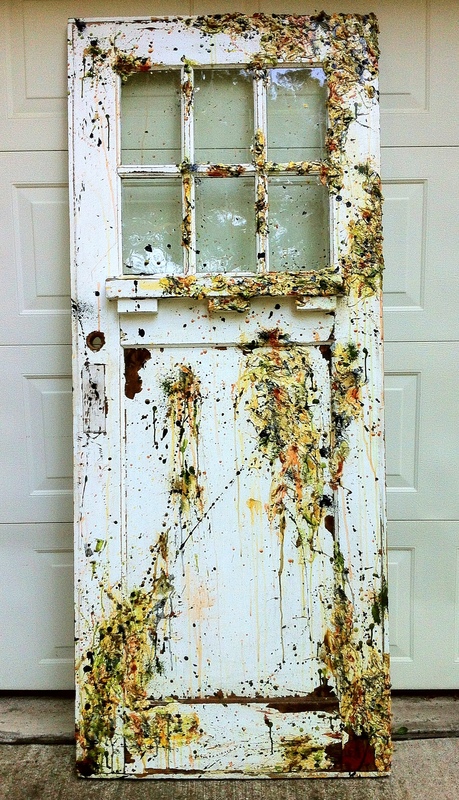 This is also a process of several layers of acrylic paint and ink, using spatulas, brushes, and droppers. 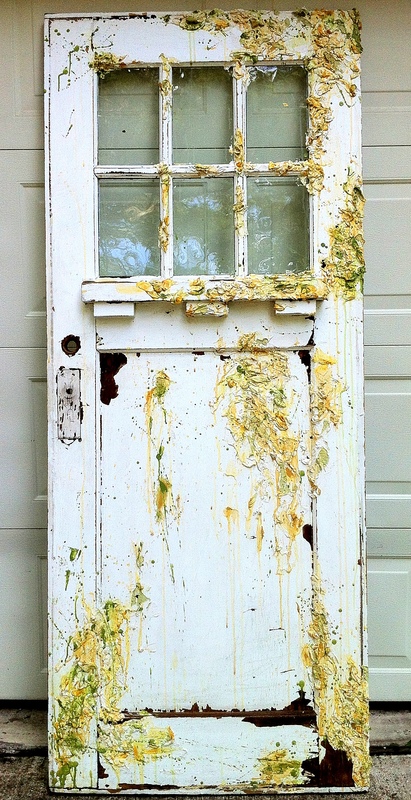 Like Pollock in his finest hours, I throw and splatter paint and inks with brushes, droppers and even spatulas without care… until I think: It is finished and it is good! Finally, with tiny brushes, I apply several layers of a semi-gloss lacquer to add a protective seal from the environment, lights and water. Then, I step back and ponder what I feel from the two pieces. I love Shakespeare and am a fan of Tom Stoppard’s play “Rosencrantz and Guildenstern are Dead”… whose namesake characters are totally memorable in their own rights and quite different from one another. And so it goes: “Rosencrantz” (L) and “Guildenstern” (R).